Precision Crane and Hoist, based in Fresno, California, has made it our specialty to fabricate, maintain, service, and repair overhead bridge cranes. Our company is a family-owned and -operated business with more than 35 years of experience. Our business has flourished over the years, as we provide our costumers with the most up-to-date and economical products and services in the industry. Our competitors just don't have the experience that we do. In addition, our crew includes an on-staff engineer. Find us to be a determined and dedicated team of professionals with the goal of providing all of our customers with the highest quality products in every job from small parts supply to full turnkey crane installations. 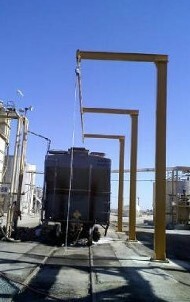 Contact Precision Crane and Hoist, the acknowledged leaders in the industry.